This E-Learning Heroes challenge required me to design an interactive graphic to show relative sizes for a series of airplanes. You can find the assignment here. The final interaction was created in Adobe Captivate 7. When the interaction first launches, the airplane graphics are hidden. 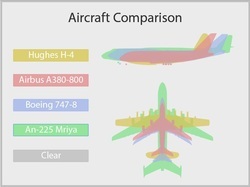 Clicking on an airplane name reveals the corresponding side view and top view graphics for that airplane. The clear button hides the pictures.